Pakistan head coach Mickey Arthur said he feels that middle-order batsman Asad Shafiq is one player in the national squad who reminds him of the God of Cricket Sachin Tendulkar. He said he visualizes the Indian batting legend every time he sees Shafiq bat. 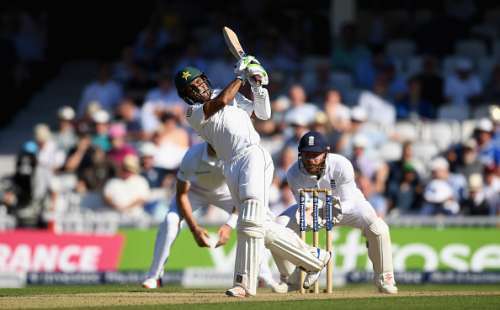 30-year-old Shafiq scored a crucial century against England in the final Test at The Oval in a winning cause, a result which drew the Test series 2-2, catapulting the Pakistani Cricket to the top of ICC's Test rankings for the first time. After batting at No.6 in the first three Tests against England, the Pakistani coach showed much faith in Shafiq by elevating him to the No.3 position for the last Test of the series and was rewarded with a hundred. It was the batsman’s ninth Test century and the second one from 13 Tests outside Asia, a great sign ahead of the tours of Australia and New Zealand this summer. “Asad Shafiq was moved to No. 3 because Hafeez was dropped. So that position has become available.There are people who want that position and somebody who fits the bill in terms of physical, mental, tactical and technical will get that role. Technically your best player should be batting at No. 3,” Arthur said. When asked to throw light on Mohammad Hafeez who, after being bogged down by injury had a not-so-good run of form throughout the England tour, Arthur remarked, “Hafeez is a very good cricketer. And all cricketers go through this little period where they don’t make as many runs as they would like. Pakistan's series against the West Indies is scheduled to commence on September 23, which will include three Twenty20 matches, followed by three ODIs and three Tests from October 13-17. After the West Indies trip, the side will then travel for two Tests against Black Caps in November, followed by a tour to Australia for three Tests, including a day-night fixture.